ICL is a factory authorized representative, service, parts and calibration facility. We stock all parts for all current MMC models and can repair and re-calibrate (with new certificate) all models quickly, professionally and at competitive rates. How often do you need to calibrate (check) your MMC (Also referred to as PET or UTI (Ullage, Temperature Interface)? The American Petroleum Institute’s (API) publication ‘Manual of Petroleum Measurement Standards’ (Chapter 7, Section 3) ‘Static Temperature Determination Using Portable Electronic Thermometers’ (First Edition, July 1985) offers specific recommendations for recalibration and verification of your electronic digital thermometer. The following section, in brown type, has been reprinted, with permission, courtesy of the American Petroleum Institute, as a customer service. The newest version of Chapter 7, dated June 2001 has the same requirements. Before initial use, and at least once a year thereafter, each portable electronic thermometer shall be re-standardized in a laboratory or other qualified calibration facility. The thermometer shall be re-standardized by comparing it at three or more temperatures with either a National Bureau of Standards (NBS) (ICL note: NBS is now NIST) certified thermometer or an equivalent thermometer with accuracy traceable to the NBS in accordance with the manufacturer’s instructions. These standardization checks will ensure that accuracy is maintained within the limits given in Table 3. Before each use, or once per day (whichever is less frequent), portable electronic thermometers should be spot checked by comparing the ambient reading against an ASTM glass stem thermometer in liquid. If the readings differ by more than 0.5 degree F (or 0.25 degree C), the portable electronic thermometer should be re-standardized before it is used for custody transfer. The junction between the cable and the probe should be checked for mechanical damage. The cable insulation should be checked for cuts, breaks, or abrasion. 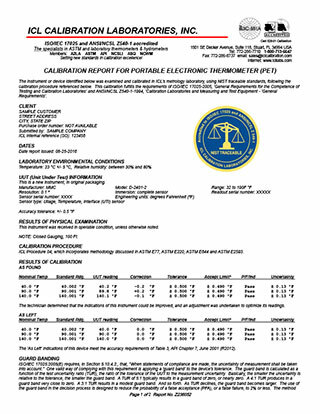 ICL Calibration Laboratories can perform this calibration and certification for you with a one to two day turnaround.